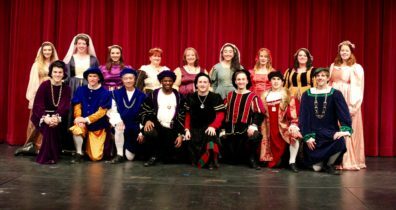 The WSU Madrigal Chamber Singers, conducted by Dr. Lori Wiest, is a select vocal ensemble consisting of 16-20 singers who perform in costumes reminiscent of the Renaissance era. Although their specialty is singing a cappella sacred and secular music from the Renaissance, their small size enables them to perform vocal chamber music from all centuries. 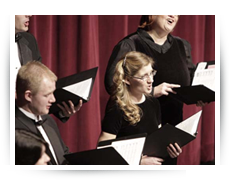 The ensemble consists of undergraduate and graduate students who are majoring in many different departments on campus, as you do not need to be a music major to be in choral ensembles at WSU! 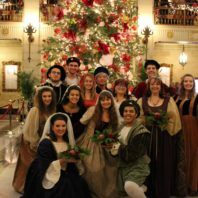 The Madrigal Chamber Singers became central to WSU in 1992 when they began to present the annual Madrigal Dinners at Washington State University in December, where they sang, danced, and acted in the spirit of Elizabethan England for a limited seating of 200 audience members each night. Currently the ensemble performs in many concerts sponsored by the School of Music at WSU and annually tours throughout the northwest region, often visiting and performing at high schools and colleges. Recent highlighted performances include a 2016 tour to South Korea, 2011 tour to Austria, 2005 tour to St. Petersburg, Russia and in March of 2000, the Madrigal Chamber Singers traveled to Arizona to perform for over 10,000 people at the Arizona Renaissance Festival. The ensemble was selected to perform at the 1998 convention of the Washington Music Educators Association. 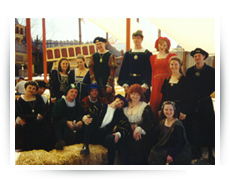 In March 1998, the Madrigal Chamber Singers traveled to Northern Italy, performing music by Italian and American composers, from the Renaissance through the Twentieth Century. The Madrigal Chamber Singers have had the opportunity to work with well-known early music specialists including the members of Anonymous 4 and Paul Hillier, as well as contemporary composers such as Chen Yi, Morten Lauridsen, and Eric Whitacre. 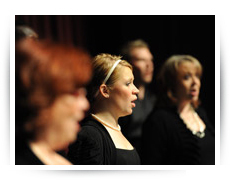 In February of 2008, the WSU Madrigal Chamber Singers performed works by Eric Whitacre conducted by the composer at the American Choral Music Festival and Festival of Contemporary Art Music at Washington State University made possible by a grant from the National Endowment for the Arts received by Dr. Wiest.